An all-new app from Apple called Music Memos will allow songwriters to quickly capture, organize and develop musical ideas on their iPhone. At the same time, a major update to Apple’s GarageBand for iOS on iPhone or iPad has introduced several new features, including Live Loops. Many musicians and songwriters already use the Voice Memos app on their iPhone to quickly record ideas. According to Apple, the new Music Memos app is inspired by Voice Memos and takes the functionality even further by adding musician-friendly features designed specifically for songwriting and developing musical ideas. With Music Memos, says Apple, you can record any musical instrument through the iPhone’s built-in microphone in a high-quality, uncompressed format, then name, tag and rate it to start building a library of your ideas. The app can analyse rhythm and chords of acoustic guitar and piano recordings, and instantly add drums and a bass line to provide a virtual, customizable backing band that plays along to match the feel of your song. Apple says Music Memos can even provide basic notation that displays the chords that were played. With iCloud, Music Memos will automatically be available across all of a songwriter’s Apple devices – so the memos can be opened in GarageBand or Logic Pro X to further develop new songs. Music Memos is available for free on the App Store and is compatible with iPhone 4s and later, and iPad 2 and later. For more information about the new Music Memos app, visit: http://www.apple.com/music-memos. “I’ve only ever written songs from the heart. I don’t really see the point in making music if it’s not an expression of self or a form of therapy. “I could go three months without writing a single song and in one week I’ll write twenty. But I never want to write a song just to have a hit. I write a song because I want it to make me feel better. Other people have different ways of letting off steam. Mine is writing songs. “It’s like when you’re angry with someone and you write an email or a letter to that person, and you write everything down … but you don’t give it to them. Songwriting is my way of getting out anger, aggression, happiness and love. It’s just about getting it out – and making you feel better. “How [Not] To Write A Hit Song! 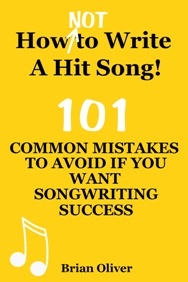 – 101 Common Mistakes To Avoid If You Want Songwriting Success” is available from Amazon as a US paperback, a UK paperback and as an eBook from Amazon’s Kindle Store, Apple’s iTunes Store (Books/Arts & Entertainment/Music), Barnes & Noble’s Nook store, and from KoboBooks. A portion of music manuscript for Happy Birthday’s predecessor, ‘Good Morning to All’ (courtesy of University of Louisville). ‘Happy Birthday To You’ is a staple of birthday parties around the world, but, until now, it couldn’t be sung in public or in TV shows and movies without paying a sizeable licence fee. Now, though, a US federal judge has ruled that music publisher Warner/Chappell does not hold a valid copyright to the song. Warner/Chappell has been collecting royalties on the song since acquiring the copyright in 1988 for some $25m (£16m). The publisher has reportedly been making around $2m a year from royalty payments whenever the song is used in a film, TV show, advertisement or any other kind of public performance. According to the Internet Movie Database, ‘Happy Birthday To You’ has been featured in nearly 150 films. Judge George King has ruled that the original copyright (filed in 1935) was only granted for specific piano arrangements based on the original melody, and did not grant any rights to the lyrics. The tune was composed in 1893 by two Kentucky sisters, Mildred and Patty Hill. They called their version ‘Good Morning To All’ which later evolved into the ‘Happy Birthday’ version which is now popular all over the world. The case against Warner/Chappell was launched in 2013 by Rupa Marya and Robert Siegel, who are making a film about the history of the song. The music publisher wanted to charge $1,500 (£970) for the right to use the song in the film, but Marya and Siegel maintained that the song was in the public domain and should not be subject to copyright fees. The ruling now puts the song in the public domain fifteen years before the copyright was due to expire in the US in 2030.